It’s now August, so RP data have an estimate for what dwelling prices did in July. The uptrend we saw in the daily data (see here) is confirmed by the NSA results (which show the 8 Capital city dwelling price aggregate +0.6%m/m) – and after seasonal adjustment this yields a +0.1%m/m increase. 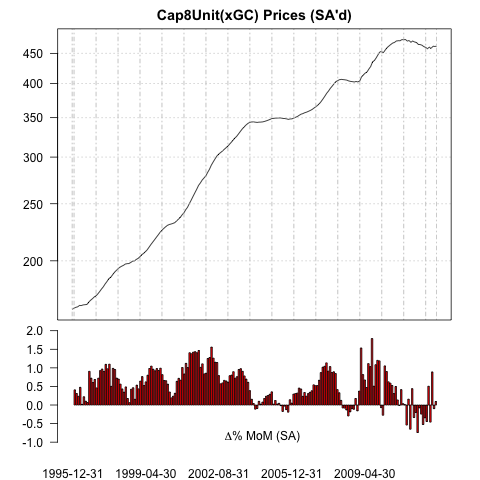 In aggregate, house prices and unit prices did similarly – with the 8 capital city measure up 0.1%m/m in seasonally adjusted terms (note i’m using the SA that RP provide, rather than my own, as i figure they know more about their data than i do). 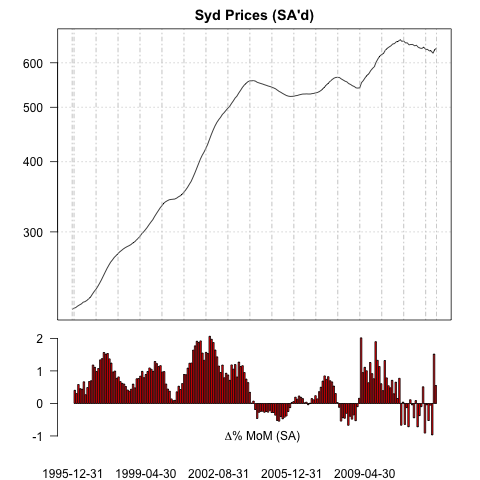 Sydney was the out-performer, with prices +0.8%m/m, to be +0.9% over the prior three months. The story seems to be that the expensive capitals — Sydney, Melbourne and Brisbane — are responding to the rate cuts (Darwin was +5% in July, but i’d guess the data is patchy) and the others continued to struggle. 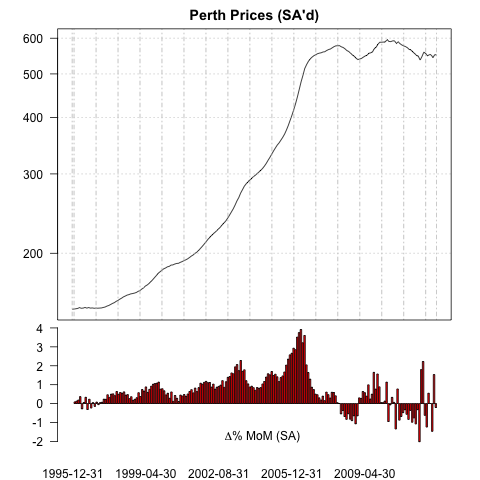 I must say, i am surprised that Perth remained in the dumps – i expect that Perth will stabilize and bounce from here. 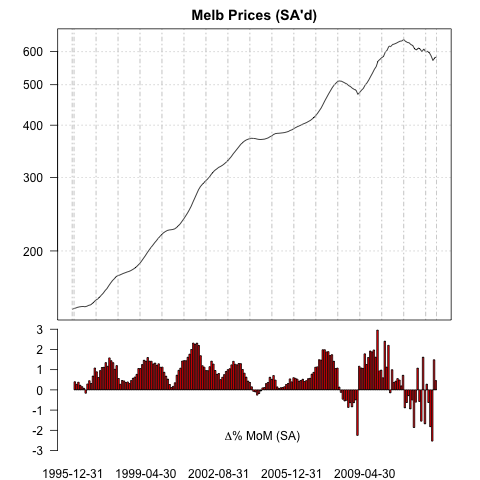 There’s been something of a fuss about what Melbourne prices have been doing, but at +0.5%m/m (house +0.2%m/m, and units +0.7%m/m) the outcomes seem in keeping with what’s going on in other states. Of all the capitals, the shape of the chart suggests that it might be too early to call stabilization in Melbourne – the downturn was steep, and thus far we have really only corrected back following a near-vertical drop a few months back. This entry was posted in AUD and tagged House Prices. Bookmark the permalink. Yes, this is the result for houses that actually sold. Volumes are down very significantly. Can you post a link to the volumes data please? It’s in the ABS house price release (up to the December quarter). Sydney and Perth = healthy. The rest is very significantly down. Thanks for the links. The second is very timely and interesting – i have not seen some of this detail anywhere ever before. Certainly makes me more circumspect about the housing market. This result was all about Sydney, which seems to be in a world of its own — not much happened in the other capitals . Brisbane was surely due for a bounce, and it was a small one. You’d have to think the downtrend in Melbourne has further to run given the amount of new supply and weak local economy — but those Vics are crazy for real estate it seems!. Perth should be going gangbusters but isn’t. Seems that houses are like bonds – you get a bigger increase in price of the ‘low coupon’ houses when the cash rate drops. I look at their data and think it probably never crashed in May and didn’t rise so much in June / July – everything is measured with error – but that at least means that the sector has probably stabilised. Buying is getting economic relative to renting – the cheaper stuff should remain stable from here. It is still unclear – IMHO – how the daily index accounts for house transactions that are reported with a delay. As we saw today, the ABS does apply substantial revisions to previous quarters and it needs up to 6 months for coming up with the “final” figure. For RPDATA, it is said they apply a mathematically calculated “time lag”, but the fact remains that today or even this month reported price index is lacking a significant percentage of transactions that are only applied “tomorrow”, when data is actually received. So today’s RPDATA price index is really what is *known* as of today, not necessarily what is happening. Considering multiple housing indicators, IMO the housing market is still very weak in most cities and supply is still exceeding demand (at these prices), even after rate cuts. We’ll see what the future brings. Presumably they have found that some ARMA model works well over short periods, and that is how they nowcast – i have not found the model in their docs, but i suspect it means that their indices are going to *dive* when the traded price in the market does turn down. It will lag the actual downturn, and then catch-down to the current lower price point when the new data builds up (this is due to the fact that estimates are not revised). Again, this is just a guess, but it makes intuitive sense – at least that is how i would do it, and the problem i would expect. This is relevant to the current assessment – the May dive had me worried that housing market had cracked, the subsequent pull up suggests that the housing market is not as unstable as i had feared. We will have to wait and see if it gains strength – something i doubt the RBA wants, but think it will accept if it means keeping the unemployment rate from spiking higher.